The software’s standard features don’t meet your particular needs? We provide you with customized solutions. The software’s standard features don’t meet your particular needs? Whether it’s individual software developents, functional enhancements or adjustments – we provide you with customized solutions. You wish to develop individual model approaches and incorporate them in the software with the help of user-subroutines? We would be happy to take on this task for you. The possibilities for adjusting and enhancing our software are as diverse as your needs, wishes and ideas. The powerful General Purpose Solvers MSC.Marc and MSC.Dytran used by Simufact.forming and Simufact.welding allow for fast and easy application. Be it the adjustment of individual parameters or kinematics, special material models, extended areas of application, assistance in model set-up or evaluating simulation results, specific import and export functions or individual software developments, we – almost – always find a solution. The module Simufact Forming kinematics offers a toolbox to easily model complex machine and tool movement sequences. Interfaces for the graphical user interface Simufact.forming and the corresponding user interfaces for the Finite Elements Solver allow you to develop your own tool kinematics with determined GUI-dialogs for parameterization. These can be controlled kinematics or kinematics determined via selected result values from the simulation for one or multi-step processes. We would be happy to assist you in developing such kinematics as part of a service project. None of our flow curve descriptions matches your tried and tested analytical flow curve functions? The materials you use have special strain hardening or anisotropy characteristics, which are not sufficiently defined in our standard material models? You combine metals with other materials? We are able to meet many of these needs through customization. In the Finite Elements Solver, as well as in the automated adjustment of the model. The Simufact Open Architecture Approach provides academic research and development teams as well as industrial development sectors with the option of implementing individual model approaches via user-subroutines (for the solver). Thus, new models (e.g. material and damage models) and features as well as individual analysis and much more can quickly be integrated into the Solver-environment. We would gladly assist you in programing user-subroutines. Starting with version Simufact Forming 13 you can calculate new and individual result values from all of the simulation’s result values via a user-friendly mathematical formula language. This function makes the programming of user-subroutines obsolete in many cases. 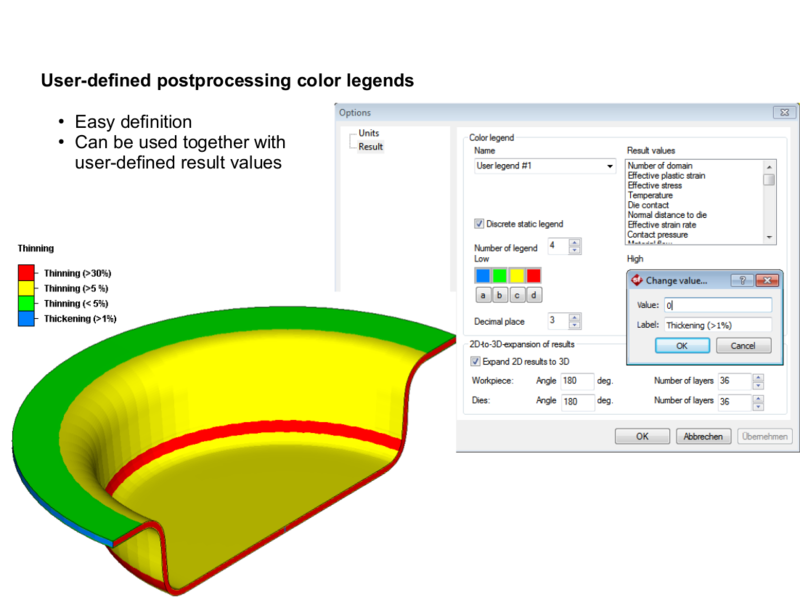 Individual color legends can be defined for the display of result values to allow for a standardized analysis of simulation results based on your own criteria. The function mainly streamlines the post-processing when investigating different variants in the design process. Routine analysis can time-sparingly be (partially) automated; the route to the best design variant for the manufacturing process is shortened. Naturally, we will assist you with the individual configuration of this option; depending on the requirements either as a complete solution as a customization-service, an introduction with individual seminars or with tips and tricks as part of our support. One strength of our customization is the unusual. Please feel free to contact us! Together with our technology partner Schuler SMG, we have successfully implemented customizing projects.